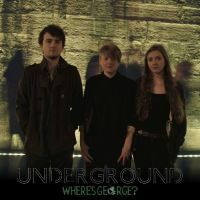 I feel so privileged to have been able to follow the developing musical career of Where’s George? Over the course of the time that I have known them the band line-up has changed, nevertheless I still have memories of them all when they were students at the school I worked in during a ‘previous life’ and find it rather special to be able to contrast my impressions of them as a teacher with those of me now in my new role. The core of the band remains Penny and Amelia, who clearly work very well together, with Chris now on bass; and for such young people the main influences that they cite are all favourites of mine from my youth: The Beatles, The Small Faces, The Rolling Stones, The Kinks, Jefferson Airplane, Cream and Fleetwood Mac – this possibly explains why they so impress me. Perhaps it’s the production and mastering by Guy Perchard, perhaps it’s simply down to a few more years of life experience – whatever the explanation, this EP displays a growing maturity for Where’s George? with earlier promise certainly being delivered. Starting with wonderful, slightly menacing, tribal drumming, ‘The Big Life’ switches moods from powerful to wistful, with the drums maintaining a common link. I have always been impressed by Amelia’s drumming style which is extremely nuanced, and much more than a basic rhythmic foundation. She can provide a good driving beat when required but is probably at her best when providing delicate and complex phrasing. 'See You' showcases Penny and Amelia's engaging vocal harmonising, along with a less rock orientated instrumental arrangement. As the track progresses, some hints of syncopation begin to appear, hinting at more to come. 'Underground' is a very pleasing journey into funk that allows Chris to demonstrate his mastery of the bass guitar whilst Penny's guitar drives everything ever onwards. Despite their declared influences there are many elements in this track that had me recalling the best of jazz/funk that had featured strongly in my listening in the mid 1970s. 'Some Like It Live' is a track that I have been familiar with from live performances; being able to hear it for the first time as a studio recording has helped to highlight the marvellous complexity of the structure which moves through a number of stages to finish with an excellent impression of the band at their live and rocking best complete with wailing feedback as a finale. You can hear all four of these tracks by visiting the band’s SoundCloud or BandCamp pages – if you go one step further and purchase the EP, it comes with a ‘secret’ track, although I suppose now that I’ve published this it’s no longer a secret! ‘How To Keep The Pace’ is an ‘unplugged’ offering which emulates the band’s occasional acoustic sets; Penny and Amelia both providing vocal input with Penny adding a bit of cajon into the mix. As with all their songs, the lyrics are a joy to listen to – very intelligently written as always. It is so reassuring to note that this excellent band with their own very individual style are continuing to be able to bring out recordings and are playing regularly beyond the Scottish Borders where they started off, having had a number of gigs in Edinburgh and Glasgow.